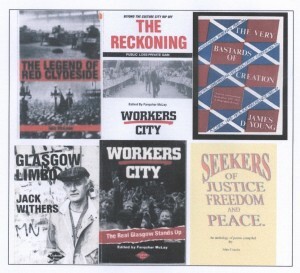 The Clydeside area generated dynamic protest movements to improve the lives of those living here as well as to change the entire system. From Letterhead Press to Laptop, autonomous protest writing has continuously made its way on to the Glasgow streets. 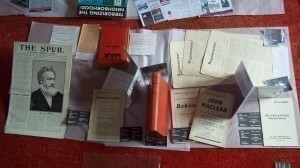 However as Ian Heavens has said the sources for the Anarchist movement are extremely fugitive and scattered – no central committee minutes exist because there was never a central committee so the contents of this exhibition include rare items preserved by activists now deposited in the Spirit of Revolt Archive. From the 18th – 19th C Glasgow came up with types of struggle opposed to authoritarianism, capitalism and conservatism. The Glasgow cotton weavers of 1773 and 1787 appear to have been largely leaderless and their strike and sabotage techniques anticipated the development of syndicalism over a hundred years later. Six of the weavers, like so many more to come, paid the ultimate price of death for militant syndicalism. Visit their graves in The Weavers Cemetery, Abercromby Street, Glasgow. In his Memoirs of a Revolutionist, Kropotkin explained the importance of small pamphlets. Books cost pennies and therefore for the poor, in socialistic literature its ‘main force lies in its small pamphlets and newspapers’. Books contain the ‘theories or scientific arguments in favour of socialist aspirations, but they give no idea how the workers accept socialist ideals and how they could put them into practice’ [Kropotkin, 1908;255-6]. Radical Presses Clydeside exhibition is a selection of small books, pamphlets and leaflets from autonomous presses, a tradition which directly impacts on our actions today demonstrating the degree to which men and women are ‘imbued with the new theories, their readiness to carry them out in their daily life and to suffer for them’. [Kropotkin, 1908;255-6] These examples are drawn from the archive of Spirit of Revolt, Mitchell Library, Glasgow and other collections listed below. Working Letterhead No3 Press loaned to this exhibition by Tommy Kayes. Case 1 The earliest Anarchist pamphlet in this exhibition includes similar homage. 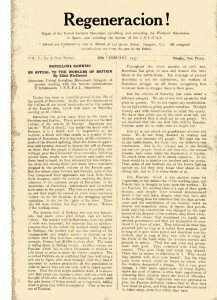 Issued by William Duff on behalf of The Anarchist Communist Federation Solidarity Leaflet No. 1- The Gods And The People was first published 1897 in Freedom – a poem by Voltairine de Cleyre. This later version loaned here by Audrey Canning at Gallacher Memorial Library, GCU, is a commemoration of Duff’s death. A writer, poet and traveling speaker her speech 10 years after the Chicago Martyrs, 1887, echoes the cotton weavers above, describing how ‘the accusation was false, the trial a farce, that there was no warrant either in justice or in law for their conviction ‘what they had stood for was a very high and noble ideal of human life, and what they were hanged for was preaching it to the common people, …these were men who had a clearer vision of human right than most of their fellows; and who, being moved by deep social sympathies, wished to share their vision with their fellows, and so proclaimed it in the market-place… “No Master, high or low”. 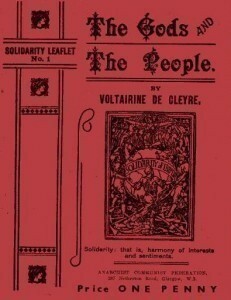 This little pamphlet of her poem, includes “Let the voice of the People be heard! O — ” You strangled it with your rope, Denied the last dying word, While your Trap and your Gallows spoke! But a thousand voices rise, Where the words of the martyr fell; The seed springs fast to the Skies, Watered deep from that bloody well! Strugglepedia says that during the 1890s international anarchists were hosted often, by the Duffs including Emma Goldman, 1895 and Voltairine de Cleyre, 1897 and Kropotkin. Voltairine spoke to the ILP and Women’s Labour Party in addition to local anarchists. There may be earlier books than the Duff publication. Duncan Dundonald, a Clydeside engineering worker who met Bakunin in Geneva in 1869 returned to Scotland to spread syndicalism and anti-industrialisation and translated the The Catechism of a Revolutionist into English in 1870. Moving to Australia his “The Great Fire of Melbourne” was published in 1898 followed by Sunshine Railway Accident at Sunshine Harvesters, in 1908 although no copies can be traced. Read more at Kate Sharpley Library. Arguing that class, not gender, is the cause of oppression, Lily Gair Wilkinson looks at the movement for women’s rights from an anarchist perspective. Her pamphlets – Revolutionary Socialism and the Women’s Movement, 1910 and Women’s Freedom, 1914, critiques the attempts to get votes for women as an irrelevance, and ultimately she stressed, the “call for ‘votes’ can never be a call to freedom. For what is it to vote? To vote is to register assent to being ruled by one legislator or another?” View online at University of Warwick and SoR. Ten years after the establishment of the Wobblies, the pan-global International Workers of the World (IWW) 1905, the syndicalist position of early William Gallacher is described in The Worker; Organ of the Clyde Workers Committee. Page 2 , displayed in exhibition, explains how self interest of a single trade undermines members of their own society advocating unity of action amongst all the workers of a given industry as being more effective. John Muir and Gallacher were both sent to prison prosecuted under the Defense of the Realm Act for an article criticising World War 1 Munitions Act which forbade engineers from leaving the works they were employed in despite conflict of conscience. 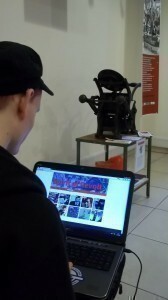 View online at TUC Archive, London. Anti-war ideas were popular. George Barrett’s The Last War sold 10,000 copies before it was suppressed. Case 4: John Couzin says ’Poems can often capture a moment in history, and do so with clarity and emotion, they can help us to see the horrors and misery of other people’s lives, but most of all, they allow us to paint a very graphic picture of our hopes and dreams, a vision of the world we are trying to create, that world where justice reigns’. A few of these small Radical Presses include, Neruda Press by Bobby Christie and Jim Ferguson, sociolect, dialect words ‘not just of locality but of class’ (see Radical Renfrew – Tom Leonard) describing the effects of sweeping reforms such as Criminal Justice Act 95 or Disability Legislation, Voline Press self published poetry and political history by John Couzin, Smeddum Press and WREN (Women’s Rights Education Network) publishing feminist books and poetry post cards (pictured here) such as Karen Thomson’s, ‘Young Women of Cornton Vale who Hanged Themselves’ imprisoned for non-payment of fines 1995-1998 or Survivors’ Press, G12, promoting poetry as catharsis in mental struggle etc. Case 3: Almost all of the above was printed by volunteer activists, particularly Tommy Keyes. Autonomy Press at the Bookshop Collective/Box 3 and later Clydeside Press have printed almost every campaign fermenting in Clydeside for the past 40 years in sticker, leaflet, pamphlet and book form. 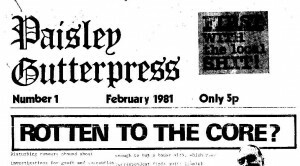 From the Paisley Gutterpress, ‘Paisley’s most negative paper’! 1981 exposing local corruption, Autonomy Press to Clydeside Press print and publishing has produced; Anti-Poll Tax, Anti War, Asbestos, Criminal Justice Act, Dawn Raids, Ecology, Education, Feminism, Hunt Sabs, Housing, Keelie, May Day, Miners’ Strike, News International/Wapping/KP, public asset stripping, Ravenscraig, Unemployment, Workers City , as well as a wide range of historical, theoretical and several children’s books. Distribution and publishing internationally from Scotland is AK Press, based in Edinburgh and includes significant work by local Clydeside writers including Jim Kelman’s Some Recent Attacks and On the Mass Bombing of Iraq and Kuwait, Commonly Known as “the Gulf War”, with Leonard’s Shorter Catechism, and Ian McKay’s A FAQ about Anarchism Vols l and ll, to name but a few. 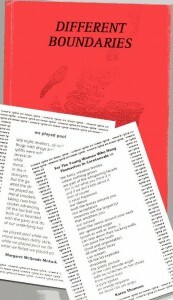 Full AK catalogue here… http://www.akuk.com/. Case 2: Prolific like Clydeside Press, the earlier Bakunin Press was set up by Guy Aldred (1886 –1963) who was an anarchist communist. Read more about him on Strugglepedia. Around 1905 he set up the first “Bakunin Press”1905- 1939 in the basement of his mother’s house, London. Visiting Glasgow between 1912 and 1919, he eventually settled here, bringing Bakunin Press with him. It published many pamphlets and books including anti-militarism and freedom of the press themes. ‘Richard Carlile’ was published in 1912, Bakunin Press, London while ‘At Grips With War’ by Aldred, 1929 was Bakunin Press in Glasgow, thereafter reprinted 2 times until 1947 and including the Workers Pledge In Times Of War stating, ‘If war comes, it is the duty of every Socialist to ask himself: ‘War! What For?’ And it is his further duty…to make and keep inviolate with his own conscience this… Workers Pledge.’ He edited five Glasgow based anarchist periodicals: The Herald of Revolt, The Spur, The Commune, The Council, and The Word. He worked closely with Ethel MacDonald, Jane(Jenny) Patrick and John Taylor Caldwell who has anthologised their work. As secretary of the United Socialist Movement Ethel Macdonald was asked to go to Spain with Jenny Patrick. By 1937 the women were in Spain sending frequent reports for Regeneracion! (included here thanks to MV Edinburgh, ACE) to rally support at home. Ethel Macdonald printed the first issue on a gestetner machine the banner read ‘Workers! Your Neutrality means Fascism! End this shameless war on Spain! !’ Caldwell says that enough funds then became available to print 4 fortnightly, larger issues 21st Feb – 14th March 1937. In 1939 the name was changed to the Strickland Press after a bequest enabling him to buy presses and rent premises at 104 George Street, Glasgow. A full Strickland Publications list of 1940 is held in Strathclyde University Library with a copy in SoR. After his death, Guy Aldred’s library of books, over 600 items, was donated to Strathclyde University, Andersonian Library, available to view. Issues of The Free Worker by William McDougall, Oct 1937- April 1938 can be read it in the Bissett Collection, Glasgow University Library. Under the Fifth Rib by Harry Derrett is a condemnation of the 1938 Empire exhibition available in the Baird Collection of SoR. Radical Presses ‘teach ourselves and others what the due social claims of labour are… handing on the tradition of our hope to others if we should die before it comes.” This from over 100 years ago in ‘How We Live and How We Might Live’ by William Morris inscribes the value of radical writing – its use in helping each other to build a better life for all. Mitchell Library Foyer, 12 – 19th. January 2013. Helen Rice, Keith Miller, Keith Fyans, Tommy Kayes, University of Strathclyde, Aldred Collection; Audrey Canning-Gallacher Memorial Library, GCU ; BA&NM Trust, MV Edinburgh ACE; TUC Archive London; Glasgow University Bissett Collection; Dr. Irene O’Brien – Mitchell Library Archives; Brian Hartley, Alexis at AK Press, Bob Hamilton. Compiled and curated by Stasia Rice and John Couzin for Spirit of Revolt.